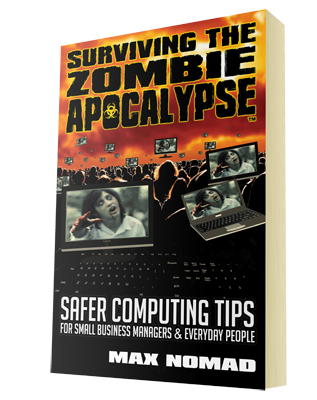 SURVIVING THE ZOMBIE APOCALYPSE: SAFER COMPUTING TIPS FOR SMALL BUSINESS MANAGERS AND EVERYDAY PEOPLE is a cyber survival guide uses the Zombie Apocalypse to teach the basics of cybersecurity and protection against Identity Theft. Written for novice PC and Mac users, this handy reference has been dubbed “the bible for staying safe while online”. If you love Romero-inspired zombie lore, strange facts, and need to learn ways to protect your computers and devices from hackers and other cybercriminals then this book is for you… It’s a must-have for any home or office, available in paperback (Amazon, B&N, Books-a-million) and ebook (Kindle, Nook, iBookstore). To begin that trip into The Dark Side of Cyberspace, visit www.ZombieFreeComputers.com.